The basic-level workshop will introduce essential programming concepts using the C# language and the RhinoCommon API (programming library). 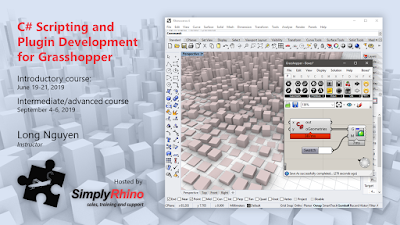 C# provides high-performance interaction within the Rhino/Grasshopper modeling environment. This lets you extend the capabilities of Rhino/Grasshopper, from automating repetitive tasks, developing customized workflows, to implementing advanced generative design algorithm and interacting with other software tools. Building on the basic-level course, the 3-day advanced course will focus on advanced aspects of C# scripting and plug-in programming for Grasshopper. In addition to going in-depth with Rhino geometries, custom graphics display, and Rhino-Grasshopper interaction, we will learn various techniques that can vastly improve code performance and significantly speed up execution time (including using multithread parallel computing and using spatial data structures such as R-Tree to speed up 3D search operations). We will also discuss and demonstrate good programming practices for organizing and structuring code to allow more reusability, extensibility, and maintainability.